Once in a while a wedding I work on strikes such a unique chord with me that I still feel the high from doing it for months to come. Larah and Lou's wedding was one of those events. 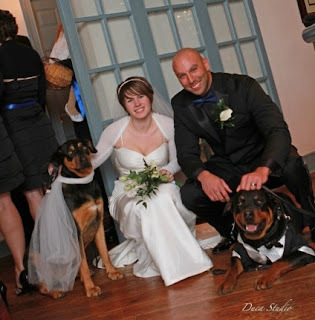 Being a dog owner and lover myself I found the personal touch of including their furry ones into the the wedding priceless. Both dogs had matching wedding attire on while they carried the rings up the isle during the ceremony to the guests accolades of delight. I even got to meet the furry couple afterwards during cocktail hour for a belly scratch and a few wet nosed kisses. The Setting at the General Warren is one of historic quaintness and a selection of food that is delicious. Musically the evening was planned by the couple working closely with me to pair the right selections of music together containing a mix of upbeat hits from Dave Matthews, Jack Johnson, Africa and more. Dinner hour was a mix of selections from the top 100 love songs from the last 20 years. After dinner the bridal party was lined up and announced into the room to "I gotta Feeling" by the Black Eyed Peas, followed by Larah and Lou walking into "Sugar Pie Honey Bunch" by the Four Tops. Larah and Lou then danced their first dance as husband and wife to "Then" by Brad Paisley. One we got under way on the dance floor Larah, Lou and guests danced the evening away. A very special thank you to Tony Duca from Duca Studios for the great images one of the greats in the industry and always a pleasure to work with.